My Cauliflower Crumble mixture resembles ground beef so much, I thought I try it out on another comfort-food favorite……like these Sloppy Cauliflower Joes. If you have finicky omni eaters who detest anything “veggie” or “Vegan” … sneak in one of these babies….. they may never know the difference! But I’m serious! 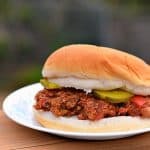 Other than the texture being a tiny bit different….and that may be because I pulsed the Cauliflower a little too long in my Food Processor – the taste is SPOT ON Sloppy Joe goodness. Yes, I know I have several Sloppy Joe recipes already. 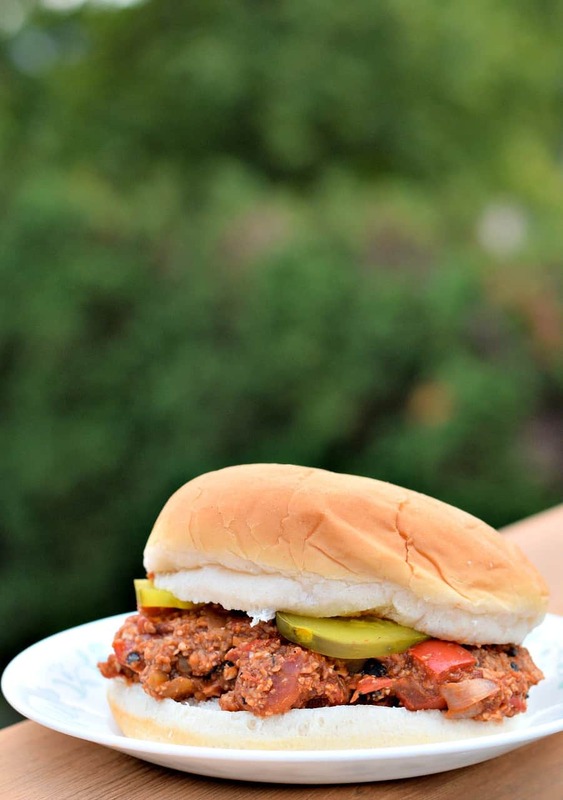 Like these Black Bean Sloppy Joes right out of the McDougall Quick and Easy Cookbook. And while these are good….. smashed beans is not the typical Sloppy Joe texture that I’m used to. I also have my Healthy Lentil Manwiches recipe – which is really good, but we’re using lentils as the filling, so again… the texture is a bit different. Picky eaters will probably be able to see these are not “real” Sloppy Joes and turn away… even though they taste AMAZING. Plus there’s the fact I was beaten up several times for using the name “Manwich” in the recipe name AND that I used Corn Syrup…..doh! But THESE Sloppy Cauliflower Joes…. they DO have a texture that’s REALLY CLOSE to ground beef. AND there’s no Corn Syrup in the recipe! 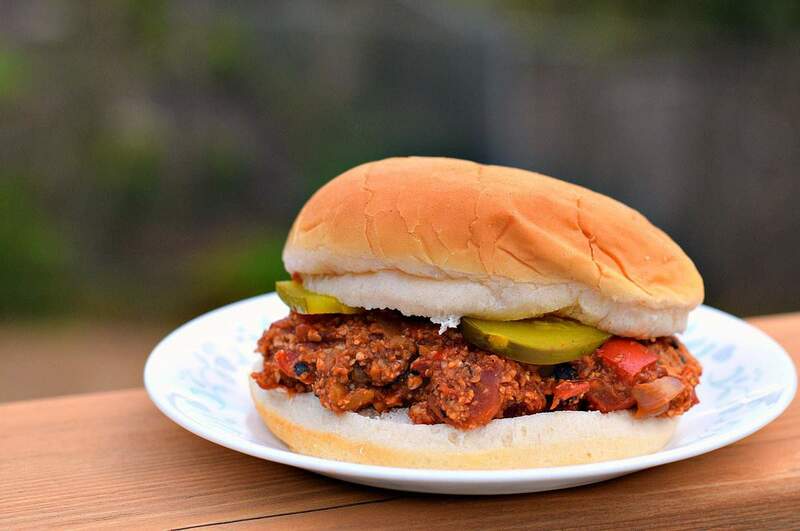 I’m just thinking these may be my go-to Sloppy Joes from now on…..because they REALLY ARE THAT GOOD! And why is the texture so important you might ask? Because WE all know how incredibly GOOD our food tastes! BUT…..those picky omnivores we all have in our family….whether they be husband, children, or whatever….. sometimes won’t even TRY our food, no matter how amazing it may taste. So MAYBE….. Just MAYBE……. If they can’t TELL they’re eating something healthy…..like my Tacos or these Sloppy Joes….we can at least get them to TASTE it! And usually, once they DO taste it they realize…….. “Hey – this rabbit food ain’t half bad”. So THAT’S why I’ve been on the Cauliflower Sloppy Joes, Cauliflower Tacos, etc kick these last few posts. Making OUR food, look like THEIR food, so they’ll at least taste it. Besides – the recipes are incredibly easy to make, they are INSANELY yummy, and Cauliflower just happens to be VERY healthy and good for us. So let’s make some Sloppy Cauliflower Joes…..
Start by sautéing half of a diced Yellow Onion, a diced Red Bell Pepper, and toss in a 4oz can of Green Chiles (or add a few fresh Hatch Green Chiles, finely chopped, if you have them) Add a splash of Veggie Broth or water to keep things from sticking and let that soften over low heat. Meanwhile, add 4oz of White Button Mushrooms to your food processor. (That’s half of an 8oz package you buy in the store). If you don’t have a Food Processor – you’ll have to chop by hand. The idea is chop so finely that they resemble rice granules or ground beef. Once the mushrooms are processed, dump them in a large bowl and add 1/4 cup of Walnuts to the Food Processor. Chop them to the same consistency and add them to the bowl with the mushrooms. If you’re trying to lose weight you can reduce the number of Walnuts or eliminate them completely, but they do add to the texture. Add 2 Tbls of Soy Sauce to the Cauliflower mixture and mix well. Add 2 cups of this mixture to your pan with the sautéed onions and stir well. Store the remainder Cauliflower Mixture for another recipe. Slowly stir in a 15oz can of drained, Fire Roasted Tomatoes. Last but not least, add the Ketchup, the spices, and all the remaining ingredients and stir well. You can use Organic Ketchup, Low Sodium Ketchup, whatever kind you like – but keep in mind that Heinz and many cheaper brands use a lot of High Fructose Corn Syrup. I personally use Organic, or Hunts, or make my own. As the Cauliflower and Mushroom cook down they’ll release a lot of their own liquid – so simmer on med-low heat until most of that liquid evaporates off and the mixture begins to thicken, stirring occasionally. Serve up on the bun or bread of your choice and serve. Now don’t tell them it’s cauliflower if they have problems with healthy food! Let them taste it first and see if they like it! Chances are – they’ll never know the difference! Picky eaters? Sneak in one of these insanely yummy Sloppy Cauliflower Joes - they'll never know they're eating veggies! Saute onion, bell pepper, and green chilis until softened. Using a Food Processor, pulse mushrooms until finely chopped. Add chopped mushrooms to a large bowl. Add 2 cups of this mixture to your sautéed veggies and stir well. Store remaining Cauliflower mixture for another recipe. Just made this again for the second time. I used a can of Ro-Tel tomatoes instead of fire roasted and it’s a great topping for nachos! Also good in a wrap with refried beans, etc. This was my first attempt at making a vegan recipe. All I can say is AMAZE BALLS! I will definitely be making this recipe again and look forward to making more recipes from this site. Thank you Chuck for making this plunge into being a vegan not only tasty but less overwhelming by giving me many ideas of how to keep myself and my husband fed. Definitely 5 star flavor! Loved it! I did add a bit more chili powder for a tad more kick, but the texture and flavor were spot on! Question: It says “store the remainder Cauliflower Mixture for another recipe.” Any suggestions? Can it be frozen? Thanks!! I’ve made this twice now and it is amazing. I leave out the brown sugar. I highly recommend Kroger Brand Salsa Style Fire Roasted Tomatoes. Additionally I found vegan Santa Fe whole grain and flax tortillas these are hands down the best tortillas EVER! 100 calories, 5 net carbs, and 8 grams of Protein per tortilla and taste amazing! I get the tortillas at Sams, 20 count 2 lb. 8 oz. run about $5. Also throw on a few sweet banana peppers and have a very tasty wrap!! What should I substitute for the walnuts since we have a nut allergy in our family? i would just leave it out and up the cauli & shrooms. I usually up the shrooms more than the cauli. Trader Joe’s has riced cauliflower in the freezer section… (other stores may too)… have you estimated (in cups) how much the 1/2 cauliflower measures out to be approximately? Cauliflowers range so much in size. I’d start with 1 1/2 cups – maybe 2 and go from there. Good tasting recipe. A couple of issues though…why would you write a recipe that includes a mixture that’s more than the recipe requires (by quite a lot)? And what are we supposed to do with the extra portion of mushrooms and walnuts? Please adjust it to create the portions that we actually need…not more, not less. And please be more specific with what needs to be repeated in step 4. It’s not clear. Thanks. Per the step 4 not being clear, read the first part of the post and it will be. I froze the extra mixture and used it at a later date. The second batch with the extra mixture tasted just as good, plus, it was a bonus not having to do the added prep the second time around. I made a double recipe and it came out with no leftover mixture. The Step 4 just means after you chop up mushrooms, then chop up the walnuts then the cauliflower.. I will freeze any mixture I don’t use today..
Good flavor. But we are not use to that much sugar. Next time I will cut down on the brown sugar. Thanks for all the recipes though!! You had me at YES with Sloppy Joes, NO when I saw Cauliflower, and back to YES! when I saw mushrooms! Great post, thanks! Made this for the 1st time tonight. Deeeelish! Due to some personal dietary restrictions, I had to cut back on the sugar. I added a few drops of liquid smoke. This recipe is definitely a keeper! Thanks for sharing it! I tend to call my sloppy like recipes with bean sloppy beans since I rather not cut up any Joes, and add them to my food. Thank you Chuck. This was fantastic! This will be my new go-to base for Ragu/Bolognese going forward. The texture is way better than soy, quorn or similar replacments! Glad to have found your site! Have nut and mushroom allergy will it taste the same without it or what can I add for the same consistency. Made these for the first time and boy oh boy were they delicious. I left out the added brown sugar and used a little stevia in place. Also used the entire cauliflower mushroom mixture and just added a bit more ketchup and some water til right consistency. It turned out awesome. This recipe is a keeper for sure. Reading through the instructions had me stumped-are you supposed to cook the cauliflower with the onion mixture orcook it more after the onion mix is out of the pan or not cook it at all? Please clarify thanks! You mix the cauliflower with the mushroom, walnuts, and soy sauce – then add that mixture to the onion is the pan. Oh my gosh this was amazing! I’ve been vegetarian for a few months and needed a menu revamp. This hit the spot for both myself and my meat eater boyfriend. We loved it so much it’s going in the rotation every few weeks or so. And we loved the “meat”. Having tried meat alternatives from the store, this was hands down the best thing ever. Can’t wait to try more of your recipes! Chuck, I have not made this but want to put some in the freezer. Does the cooked mixture freeze well?